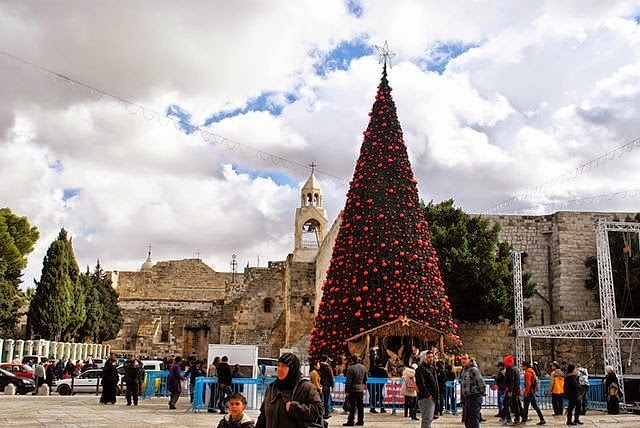 Orthodox Christmas celebrations kicked off in Bethlehem as hundreds of Orthodox Christians, pilgrims and clergy paraded in the Nativity Square to receive patriarchs and bishops. The Greek Orthodox Patriarch of Jerusalem Theophilus III arrived Tuesday at Manager Square, marking the start of Christmas Eve celebrations according to the Julian calendar.... President Mahmoud Abbas as well as a representative of King of Jordan Abdullah II are expected to arrive in Bethlehem later to attend the mid night mass that would be presided over by Patriarch Theophilus III. A few weeks ago, BAS's Bible History Daily had an essay by Andrew McGowan outlining some possibilities about how December 25 and January 7 were chosen by early Christians. One theory, which is very popular, is the idea that early Christians, having no biblical evidence to choose a date, chose to appropriate a pagan holiday that happened to fall on Dec 25. In the East, too, the dates of Jesus’ conception and death were linked. But instead of working from the 14th of Nisan in the Hebrew calendar, the easterners used the 14th of the first spring month (Artemisios) in their local Greek calendar—April 6 to us. April 6 is, of course, exactly nine months before January 6—the eastern date for Christmas. None of these dates, though, need be historically reliable, but the proper calendrical date is not the point; the point is to establish theologically significant dates and dates upon which to celebrate these events. Putting too much historical or calendrical weight on any of these celebrations crashes the whole edifice to the ground.....Why is it necessary to create historical evidence where none exists? It is not necessary, unless one places too much credence in spiritual truth as equitable with historical veracity. This much I know: Jesus was born on some day and whether it was December 25th or some other day, I am happy to celebrate it.